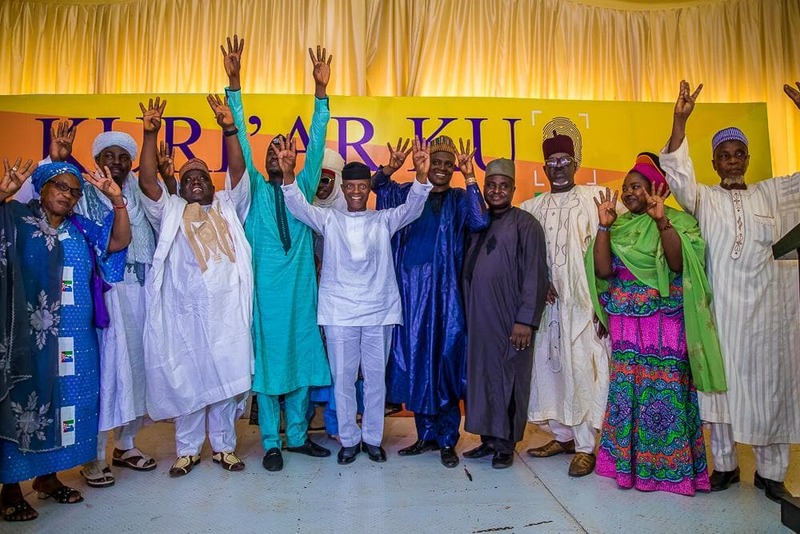 Vice President Yemi Osinbajo on Wednesday solicited support of the Hausa community in the Southwest for the re-election of President Muhammadu Buhari and other APC candidates in the zone. According to Osinbajo, it is unfortunate that the country has become a place where people who are in power believe that the country’s money belong to them and their friends. Osinbajo said that public funds should be used for infratructure like roads, power, schools, hospitals and that was what Buhari was committed to which some corrupt people did not like. He said that the first term of the President was used to build the foundation, saying that remarkable achievements had been made on railway, power, road and other infrastructure. Osinbajo recalled that Buhari’s achievements as a former Head of State and petroleum minister were still there for all to see, saying that three of the four nation’s refineries were built by Buhari with 3500 k/m of pipelines. “This kind of man deserves a second term. If he leads this country for another four years, this country will change completely. It will be impossible for thieves to come back to this country. “This election is about the future of the country, it is about the future of our own children and our own future. We must not allow anybody to do anything that will upset where our country is going. “Muhammadu Buhari has done a term now by May it will be four years; In another four years I promise you by the Grace of God, this country will be a different place, it will be a country that all of us will be proud of,” he said. The vice president, who said that he didn’t doubt the sincerity of the Hausa leaders to vote, charged them to mobilise the Arewa community to come out en mass to vote. Alhaji Ahmed Kabiru, the Chairman, Arewa Community in Lagos State who commended Osinbajo for recognition of the community, said that Buhari remained a sell-able product. “The principal thing I am selling is President Muhammadu Buhari and Vice President Yemi Osinbajo. I have to sell it to this audience. “On behalf of the entire Arewa community across the nooks and crannies of the South West Nigeria, I want to reassure you of our support, our unflinching support for APC. “We are going to vote APC from the very top to the lowest position. I assure you, we are going to do this,” he said. He said that the group had been significant during elections and had been contributing to the success and development of APC in the state, urging Osinbajo not to forget the Arewa community. Alhaji Sadiq Babangida, Hausa Leader in Akure, said that the community would not change its decision to support APC, adding that the country needed honest and sincere leaders. Meanwhile, Osinbajo made a proposal aimed at resolving the protracted crisis rocking the All Progressives Congress (APC) in Zamfara, Sen. Kabiru Marafa (APC-Zamfara Central) has said. Marafa disclosed this while speaking with State House correspondents after a private meeting with Osinbajo on Tuesday, February 19, at the Presidential Villa, Abuja, the News Agency of Nigeria (NAN) reports. He said that the postponement of the 2019 Presidential and National Assembly elections provided an opportunity to APC in Zamfara state to resolve the stalemate.